At age 37, Josh Harlan came to a tough conclusion: He would never be able to lose weight on his own. Weighing in at 385 pounds, he knew he did not have the willpower to improve his health. “I was slowly going to wither away and die,” he says. 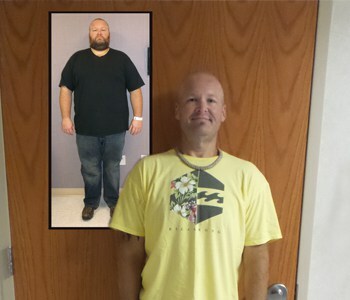 Harlan, who works as an imaging technologist at hospitals across the country, heard about Saint Francis Healthcare System’s Weight Loss Solutions through his father, who previously worked there. 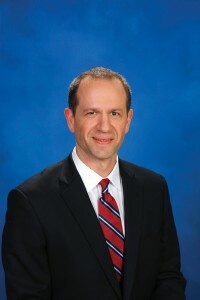 He met Ryan A. LeGrand, MD, bariatric surgeon, Saint Francis Medical Partner who leads the weight loss surgery program, and decided it was the solution for him. On January 17, 2014, Harlan underwent the gastric sleeve procedure, during which the surgeon removes about 85 percent of the stomach so it takes the shape of a sleeve. Patients who have this surgery find that because their stomach is smaller, they need much less food in order to feel full. Since his surgery, Harlan’s life has changed dramatically. Now 39, he has become an avid hiker. Hiking is a hobby he had always been interested in, but was never able to pursue because he became tired so quickly. Since last May, he and his Siberian husky have logged more than 1,200 miles. “Two years ago, if somebody had told me I would be where I am right now, I would have called them a liar,” says Harlan, who now weighs about 220 pounds. It has not been easy becoming accustomed to a smaller stomach. But Harlan says the journey has been more mental than physical for him. Before the surgery, Harlan’s goals were simple: He wanted to be comfortable flying in an airplane and be able to go shopping in a “normal” store. He has now achieved both of those goals. “It’s nice to try clothes on and actually have them look good on me,” he says. For more information on Weight Loss Solutions, call 573-331-3996.